Buried deep within the 429 pages of the tax reform proposal, titled the “Tax Cuts and Jobs Act,” is a provision that would significantly change the landscape for executive deferred compensation plans. Specifically, Section 3801 of the Act, titled “Nonqualified Deferred Compensation,” would move the point of taxation of most forms of deferred compensation from the time of actual payout to the executive, which is generally the case under the current rules, to the point at which the executive need no longer perform substantial services in order to receive the compensation; e.g., the point at which the funds “vest.” Other changes are proposed, but this single timing issue would remove much of the appeal of deferred compensation plans. The changes, if they become law, would affect not just deferrals of cash compensation, but also equity forms of compensation such as stock options and stock appreciation rights. The Act would also repeal the current compliance regime for nonqualified deferred compensation, known as the “Enron rules” (because they were inspired by manipulation of deferred compensation by certain Enron executives), and codified at Code Section 409A, which have been in place since 2005. The new rules, if passed into law, will be set forth under Section 409B of the Code. This is not the first time that Congress has proposed these changes to deferred compensation; a version of them appeared in the Tax Reform Act of 2014, also under Section 3801 of that bill. An excellent and detailed overview of the those earlier proposed changes appeared in the Summer 2014 issue of the Benefits Law Journal. The article deserves re-reading now that deferred compensation reform is back on the table under the Tax Cut and Jobs Act. Amounts set aside under Section 457(f) plans must be included in the executive’s taxable compensation once the amounts are no longer subject to a “substantial risk of forfeiture,” for instance upon completion of a vesting schedule. Due to the requirement that income inclusion/taxation occur when the risk of forfeiture lapses, Section 457(f) plans generally work best when retirement is in the fairly near future (e.g., 2 to 7 years out), and where vesting occurs on or near the anticipated retirement date. Traditionally it was not uncommon under Section 457(f) plans for organizations to push back a previously established vesting date, to allow the executive to work additional years for the organization without triggering taxation of their plan accounts. This practice of “rolling vesting” was popular for the planning flexibility it allowed. Another popular practice under Section 457(f) plans was to use a covenant not to compete to prolong the substantial risk of forfeiture (and hence postpone taxation) for several years after an executive’s departure. Both of these practices – “rolling” vesting, and use of covenants not to compete, came under a cloud, however, when the Congress passed legislation in 2005 that included a comprehensive set of rules governing nonqualified compensation plans. The rules, codified at Section 409A of the Code, were passed due to perceived and actual abuses of deferred compensation plans (for instance, the Enron executives triggered acceleration clauses under their plans when they foresaw the company’s demise). 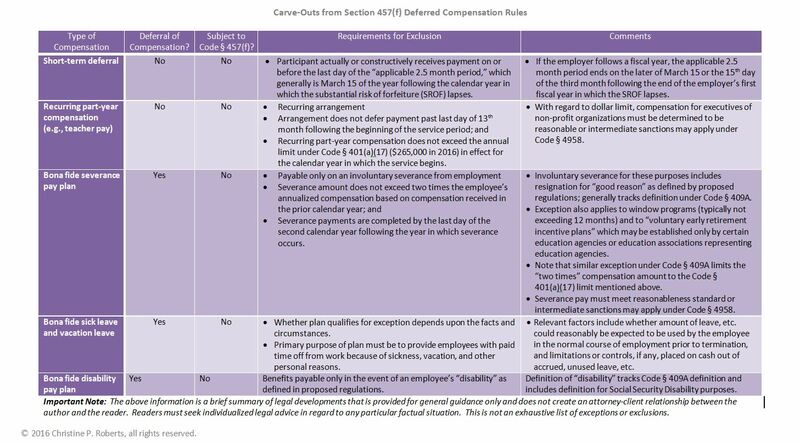 Section 409A disallowed acceleration clauses and imposed a plethora of other design restrictions on nonqualified deferred compensation. Section 409A was expressly made applicable to Section 457(f) plans, but final regulations issued in 2007 did not fully explain the intersection of Sections 409A and 457(f). Separate guidance, in the form of Notice 2007-62, suggested that when formal guidance did issue, it would not recognize rolling vesting as a legitimate tax deferral measures. Final Section 409A regulations expressly disallowed covenants not to compete as means of creating a substantial risk of forfeiture. Therefore, for nine years, risk-averse sponsors of Section 457(f) plans have avoided rolling vesting and covenants not to compete, and have accustomed themselves to the stricter, post-Enron plan design rules. As explained in the chart below, the proposed 457 regulations have resurrected rolling vesting, and also permit a covenant not to compete to create a substantial risk of forfeiture, subject in both instances to some tricky prerequisites. This added design flexibility for 457(f) plans is good news for non-profit organizations, which increasingly must compete for talent with for-profit organizations. the occurrence of a condition that is related to the purpose of the compensation, (such as a performance goal for the employee, or to the employer’s tax-exempt or governmental activities (such as completion of a funding campaign). As under 409A, there is no SROF if the facts and circumstances suggest that the employer is unlikely to enforce the forfeiture condition. Relevant facts and circumstances include the employer’s past practices in enforcing (or not enforcing) forfeitures, the level of the benefitted executive’s control of or influence over the organization, and the likelihood that the conditions would be enforceable under applicable law. The proposed 457 regulations may be relied upon until the effective date (the “applicability date”) of the final regulations, which will follow their publication in the Federal Register. Transition relief applies only to certain union and governmental plans, such that risk-averse plan sponsors should consider taking steps to voluntarily comply with the proposed regulations in advance of the applicability date. Finally, compensation for the non-profit executive must meet reasonableness standards or it will potentially trigger excise taxes under Code Section 4958. This standard applies to deferred compensation amounts, and increases in those amounts, including, arguably, the minimum increase necessary under the new rolling risk of forfeiture rules.